BOLD intense graphic design made from using late 19th century silk most often found in cravats and waistcoats; probably these were all tailoring scraps. 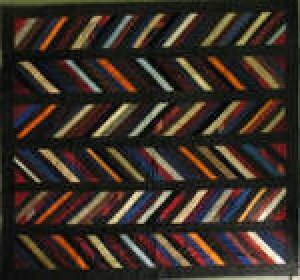 By tilting the angle of the narrow strips and placing them in bands in upward or downward directions, the maker achieved a rhythmic quilt surface. Whether it is displayed horizonally or vertically it rivals a lot of contemporary art.